In 5.1.3 and before I was able to map a keyboard shortcut that I liked to run unit tests in the context of the mouse cursor. So if I was working in a test I could simply hit the keys and that single test would run as long as the cursor was inside the test method. A very nice feature I loved. 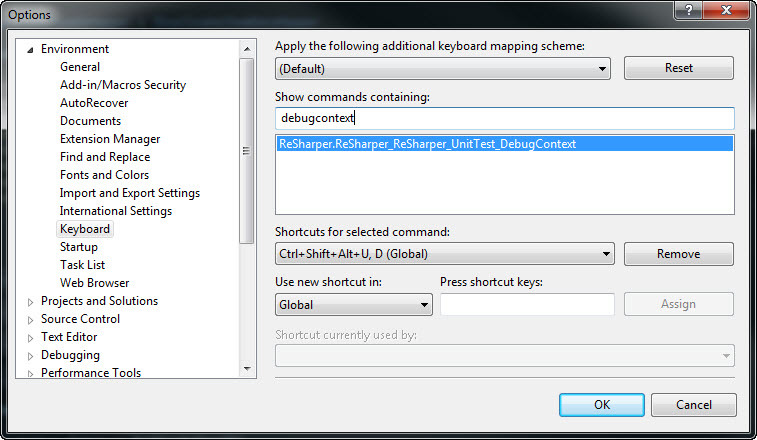 In VS Tools/Options/Keyboard you could navigate to Resharper.Resharper_UnitTest_ContextRun and map it to shortcut keys (R# 5). This _ContextRun is no longer offered. I tried the new 6.0 Resharper.Resharper_UnitTest_ContextMenu_HostProvider1 thru 5. These do not behave the same as ..._ContextRun in 5.1. (I don't know what _HostProvider1 - 5 means). There seems to be no way any more to map running a single test to a keyboard shortcut. I hope that this feature is not removed in 6 as I found it very useful. I was happy w/ 6.0 nightly's until I discovered this so I went back to 5.1.3. Is there is another way to map running tests in context of cursor, or can this feature be returned to 6.0? Resharper.Resharper_UnitTest_ContextRun would run a single test or all tests in the fixture depending on where your cursor was. I posted this on the bug too.